ATLANTA (October 27, 2014) – Recently publicized corporate policies and comments from top U.S. executives have highlighted the issues and challenges women still face in today’s workplace. But how do some of the most powerful female professionals in Atlanta feel about these issues? What do they see as women’s greatest challenges and opportunities in today’s workplace? And how have they seen this landscape change (or not change) throughout their careers? The annual lunch event, which offers networking opportunities- in addition to the groundbreaking discussion from presenters and panelists – will be held at the Buckhead Intercontinental Hotel and will raise funds to support the Eating Disorders Information Network (EDIN). 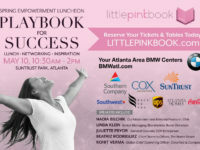 To learn more about the details of this year’s event, please visit: http://www.littlePINKbook.com/live-events/. Now in its tenth year, PINK’s Signature Fall Female Empowerment Event is an annual luncheon addressing the most pressing issues facing working women today. Touching on topics like equal pay and advancement opportunities, the event features an impressive line-up of female speakers and panelists in key leadership positions. Attendees also have the opportunity to network with other professional women, shop the PINK Bazaar and participate in this year’s raffle support the Eating Disorders Information Network (EDIN). The sponsors who make the event possible include The Coca-Cola Company, InterContinental Hotels Group, Newell Rubbermaid, The Home Depot, Southern Company, UPS, Intimacy, Dunkin’ Brands, Northside Hospital, Southwest airlines, Atlanta Homes & Lifestyles, Everywhere, Giorgio Armani, Bloomingdales and Spelman College. Little PINK Book is a top digital platform for America’s ambitious, intelligent women eager to advance in their careers; and for companies dedicated to making that happen. Events, social media, videos, blogs and more on LittlePINKBook.com and weekly eNotes give needed visibility to top women and serve as a mentor, career coach, financial advisor, entrepreneurial expert and office style maven — all rolled into one. In 2014 PINK hosts its 10th Annual Fall Empowerment Event connecting women leaders everywhere.